Amblyopia or "lazy eye" is a term that is very commonly used but the meaning may not be completely understood. Some erroneously consider a lazy eye to be an inward or outward turning eye or a droopy eyelid (although these conditions are all inter-related). Some also mistakenly do not consider amblyopia to have any effect on the vision. In fact, it is a preventable cause of visual impairment which, according to Prevent Blindness America, affects up to 2% of the general population. SO WHAT EXACTLY IS AMBLYOPIA? It is a condition where the vision is reduced in an eye that has not been adequately used during childhood. The eye is physically normal, although there are generally underlying reasons for the visual pathways to be underdeveloped. Usually one eye is affected, but it is possible to be affected in both eyes. Your newborn will be able to see, but his or her vision will rapidly improve as the eyes are used during the first months of life. The visual pathways that connect the eyes and brain develop throughout childhood until about the age of 8 years, but particularly within the first 2 years of life. Beyond 8 years, the visual system is fully developed and the connections and nerve pathways are no longer able to change or improve. Anything that disrupts this development process is likely to cause impaired visual acuity and depth perception, which may be permanent. Your child's first 8 years of life is therefore very critical for good vision later on in life. Amblyopia occurs when there is a disruption in the visual pathway development process. When the image from the affected eye is not clear (for whatever reason), the other eye tends to compensate and becomes the dominant eye. The affected eye in turn becomes suppressed and is left further behind. The visual pathways of the dominant eye become better and better developed, while that of the affected eye undergoes little development. If this persists, the affected eye may become useless with very poor vision. Unfortunately, this cannot be fixed later on in life. WHAT ARE THE MAIN TYPES OF AMBLYOPIA? Amblyopia is generally classified according to why the vision is affected in the first place. There are 3 types: strabismic, refractive and form deprivation. Strabismic amblyopia: This is the commonest form of lazy eye. Strabismus or squint is a condition where both eyes do not work together as a pair, resulting in the eyes looking in different directions. Most commonly, one eye turns inward while the other looks straight ahead. Strabismus affects up to 5% of children, and typically start between 18 months and 4 years. The most frequent reason for strabismus in children is hyperopia or longsightedness, which can be corrected with spectacles. When there is strabismus, the eyes stop working together properly and double vision occurs. To stop the double vision, the brain 'switches off' the weaker eye. As a result, only vision from one eye is used. It is this effect of 'switching off' the eye that causes amblyopia. There are different types of strabismus. One of the ways of naming squints is based on the way the weaker eye turns. In esotropia, the eye is turned inwards. In exotropia, the eye is turned outwards. In hypertropia, the eye is turned upwards. 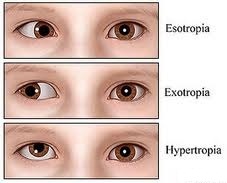 In children, esotropia is most common and is associated with longsightedness (hyperopia). Exotropia is more common in adults. Refractive amblyopia: This occurs when there is unequal refractive error between the two eyes. Typically, one eye is significantly more hyperopic or myopic and hence the image from this eye is blurred compared to the other eye, which becomes the dominant eye. This blurring affects the normal development of the visual pathways for the affected eye. Form deprivation amblyopia: This occurs when there is insufficient light entering the eye to stimulate the retina and optic nerve. 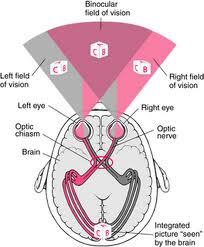 With the lack of light stimulus, the development of visual pathways becomes disrupted. There are many causes of opacities blocking light from entering the eye. The most notable are: cataract, corneal scarring, drooping of the eyelid and tumors. If the underlying reason is not treated as early as possible, the poor vision may persist even if the opacity has been successfully treated. In the right eye, the pupil appears white due to the cataract. Due to its opaque nature, the cataract prevents light from entering the eye, thus causing form deprivation amblyopia. Make no mistake - having a lazy eye means having visual impairment. Early detection from vision screening and subsequent treatment is vital because of the potential permanent sight loss that cannot be made better later in life. Most children who are detected early and treated appropriately do extremely well and achieve good vision in the long term. Spectacles will help with the focusing and any misalignment of the eyes. All children with lazy eye have to be tested for the need to wear glasses. Properly prescribed spectacles provide clear vision to both eyes, and should therefore be worn at all times. It may be difficult to persuade your child to wear glasses, but it is important to persevere and to provide lots of encouragement. If your child says that vision is better without glasses, it is because your child has previously worked the eyes hard to compensate (by over-focusing). This can cause some difficulty to relax the eyes and thus the vision may seem blurred with the spectacles. As the eyes learn to relax, the spectacles will provide the focusing power to allow things to be seen clearly. 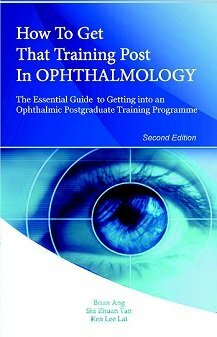 Patching or occlusion of the good eye forces the weaker lazy eye to work harder, thereby enhancing visual pathway development and strengthening the vision. The amount and duration of patching depends on how severe the lazy eye is. 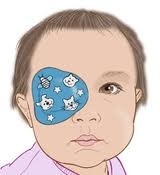 To obtain the full benefit of patching, ensure that your child actively uses his vision when the patch is worn, such as to read or write. The best outcomes are achieved if patching is started before the age of 5. Orthoptic eye exercises can help to improve the way the eyes work together. They are commonly used together with spectacles and are beneficial for those with strabismus. Finally, it is important to treat any underlying reason for the lazy eye. Any associated strabismus should be considered for treatment with surgery or botox injections. The causes of form deprivation, such as cataract, drooping eyelids and tumors, often require surgical correction and should be performed in a timely fashion. These treatments need to be performed together with spectacles, patching and eye exercises to give the best chance of success.